Unfortunately only a part of the box is visible which might imply that it’s a fake. But let’s talk about the specs and what other sources speculate. Although the screen is quite big and comes really close to being a phablet, I quite like the idea of having a 1440p 5.25-inch display. Rumours from the end of December 2013 already implied this. Latest rumours suggest that we’ll see two Galaxy S5 versions, one with a Qualcomm Snapdragon 805 and a second one running a 64-bit eight-core Exynos processor. With the iPhone 5S already running on a 64-bit system I believe that one of the Android flagship phones will follow this path as well. Although a 20 megapixel camera sounds awesome, we’ll have to see how the camera performs in different situations. 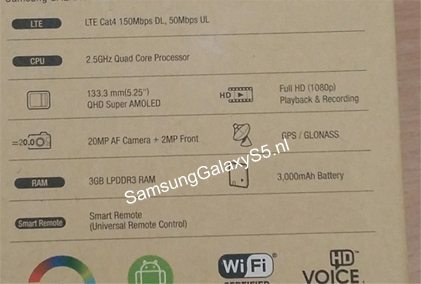 Samsung also announced a 16 megapixel ISOCELL camera sensor for its flagships last November, so it would be strange to see a 20 MP camera in the Galaxy S5. Having a 3,000 mAh battery sounds reasonable and I really hope that the phone will last longer than a day of active use. Coming from a Nexus 4, battery life is one of the most important features for me. The phone will most likely be running Android 4.4 KitKat and come with a newly designed TouchWiz as a recently published image suggests. With Samsung highlighting privacy, it’ll be interesting to see which privacy features will be implemented in the Galaxy S5. The phone is expected to come in either a plastic or a metal body. It is very likely that the quad-core edition will come in the plastic case and the 64-bit version in a more premium metal one. Samsung’s new flagship phone sounds promising and it’ll be interesting if Samsung will finally offer a more premium, none-plastic version. We’ll keep you updated!